Love those delightful, leafy, green shadows! And what a great capture! Hope you're enjoying a lovely weekend! great - looks like a japanese print and would make great wallpaper!! Stunning. And I really like the glimpses of blue sky behind the leaves. 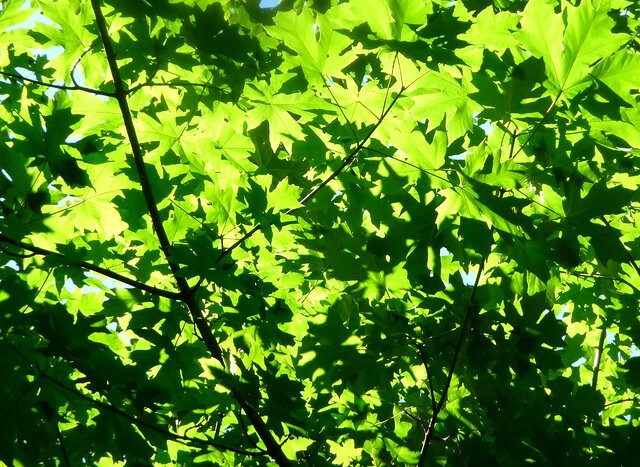 Beautiful leaves, playing with the sun and shadows! Lovely green shadows -- I also love the bike in the post below -- actually I want that bike! Even though I'm much too old for it. I scrolled down a few posts trying to figure out how to comment -- oh -- I see whadya think! (doh) (it's late and I'm a little slow) -- but I'm glad I scrolled down -- love your blog!